Mon Cheri’s supremely elegant and exquisitely-tailored tux is crafted of 100% wool in a sophisticated shade of deep Steel Gray that makes a perfect canvas for accessories in virtually any color. The single-breasted, 2-button, side-vented coat features a notch collar. 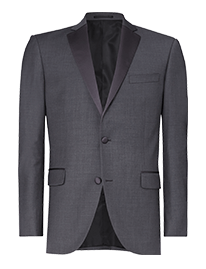 Steel Gray grosgrain – rather than traditional satin – trims the lapel and the straight flap pockets.